Ray Comfort is the George Whitefield of the 21st Century. This is a man that has been so faithful over his Christian lifetime in sharing the gospel to everyone he meets. He exemplifies a man who has no fear of man, is not ashamed of the gospel, and is willing to be obedient to the Lord’s command to “go into all the world and preach the gospel.” He has shaped my life and my love for evangelism. 10 Out of 10 People Die by Anchored North. 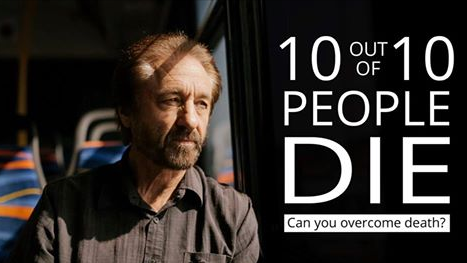 On July 9th, Ray Comfort will be releasing another powerful and challenging film (see 180 movie) called Evolution vs. God. Ray, in his bold style and penetrating questions, goes on campus at University of California, Los Angeles (UCLA) and University of Southern California (USC) and interviews professors and students. He also interviews students at Long Beach State University. As Ray interviews evolutionary scientists, he asks a question something like this: “Is there scientific evidence—observable evidence—to support evolution?” Well, none of them could provide anything remotely scientific. Oh, they give the usual examples about changes in bacteria, different species of fish (like stickleback fish), and, as to be expected, Darwin’s finches. But as Ray points out over and over again in Evolution vs. God, the bacteria are still bacteria, the fish are still fish, and the finches are still finches! These changes are in fact just the opposite of man-to-molecules evolution. And when Ray interviews university students who believe that evolution is fact, you will quickly see they have no idea how to defend evolution. They ultimately place their trust in their professors and textbooks. It is the blind leading the blind. So enjoy the trailer to Ray’s new film and whether you are a Darwinian evolutionist or a Christian, check it out. This is another great movie done by Ray Comfort called Genius – The Movie. It is 34 minutes well worth your time and thoughts. As a young man states in the movie, it may just change your life. Here is a powerful analogy by Ray Comfort of true and false conversion. Something to take to heart among every professing believer. Every authentic Christian fully understands the sacrifice of the Father for our transgressions and our faith inevitably works out in evidence of good works for the Lord’s glory. A father and son were once on a camping trip. After they pitched the tent, the father said, “Son, see that river, it’s full of crocodiles, and if you want to fish, fish off that wharf.” The kid says, “Ok, I’ll fish off the wharf.” For three days that kid fished off the wharf. He got kind of bored and began thinking I’d be safe in a boat and fishing with crocodiles will be kind of exciting. So in a sense of bravado he grabbed a boat and went to begin fishing among crocodiles. 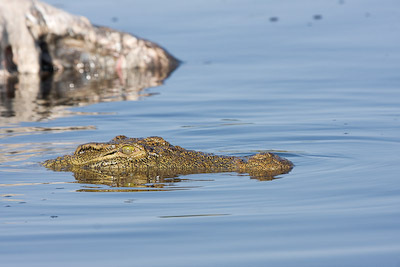 Now things were fine for a time until a crocodile came alongside the boat, and the tail of the crocodile hit the boat. The boat overturned, the kid screamed in terror and the father heard him scream. Without hesitation, the father dove off the end of that wharf into crocodile infested waters, grabbed his beloved son and pulled him to the safety of the shore. When the son opened his eyes he saw a terrible sight. A great crocodile got his jaws wrapped around his father’s legs leaving him bleeding shreds. If that kid could think such a thing, let alone speak it. The blind fool doesn’t see the sacrifice the father has just made for him. And to a professing Christian, if you have any even hidden desire for the sinful excitement of the world, then you have never seen the sacrifice of the Father. If that son has truly seen what his Father has just done for him, a sense of horror will consume him, at the cost and extreme lengthy expense his Father went to save him, he will walk intent in the very drops of water that still cling to his flesh.